A more affordable alternative to the Siemens Cca is the Amperex 7308 made in USA version. It's not a Cca but pretty close. I know they can be expensive but you will forget about the cost once you hear them. I find your chronology of 490t tube rolling fascinating. Are the Amperex 7308 tubes you mention PQ (non Jans)? What would be a fair price for a matched pair in the strong range? The JAN (joint army navy ) are the same tubes. You should be able to get a NOS or very strong pair for $150. 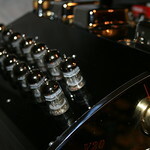 Don't confuse them with the Amperex 6922 PQ which is also a fine tube but has a warmer sound. There is also the Amperex Holland made 7308 but it is also different than the USA 7308. I use the Holland's in my preamp and Siemens Cca's in my cd player. I have Amperex USA 7308 in my other preamp. Important note, the USA 7308tubes I have heard were all white label from the early to mid 60's. I haven't heard the orange labels. Now the Amperex PQ 6922's i have heard both white and orange labels and they sound identical. Dont buy any tubes from china or Hong Kong and I usually only buy from ebay''ers with 100% feedback. Good call on the JAN Philips 6922 Eric! All Tube players so what one should I keep??? What "3" do I sell and have the Best sounding player of all 4. Can the 490t with Jan Phillips beat all the rest? Which one sounds best to you? That's what really matters. I would also think about which unit is the oldest. Age will begin to be a problem as will a players ability to play ripped/burned CDs/DVDs. Which one sounds the best and had a good following, parts and service. You'll need to have it in for service eventually. Here is a way to avoid waiting for the tube CD player to be fixed. Just buy a completely new CD Player. Bet you won't see too many of those these days. Hmmmm...that multiple disc tube CD player, new in the box, is still setting out there. Wonder, as all disc players continue to dissappear into the fog of time past, if that's one to look back at and say one of these days, "it seemed like too much at the time".